While fighting a street gang, Batman and the thugs find themselves terrified by a shadow. Batman is perplexed by this turn of events. Later that night, Bruce dreams of the Scarecrow, waking with a start. Alfred is awake, too, also having dreamt of the Scarecrow. 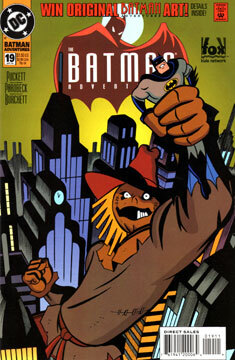 Batman then learns that Jonathan Crane has once again escaped Arkham, but not before donning the Scarecrow costume. He seems to have simply walked out. The Scarecrow’s first target is the annual convention of the Gotham Board of Psychiatry. Batman arrives, and is immediately shaking in fear at the sight of the Scarecrow. He quickly realizes the mere sight of the Scarecrow induces panic, but only the sight. Batman shuts his eyes and leaps after the escaping Scarecrow. Comparing the current situation to the Scarecrow’s last caper, Batman realizes some sort of transmission must be causing the effect. He tracks the power output necessary for such a transmission, and finds a mad scientist conducting “experiments” based on Scarecrow’s technical ideas. Meanwhile, the Scarecrow is causing panic wherever he goes, until Batman shows up and simply removes his mask. The panic ends. This is another fine script that would have made an excellent episode. Batman spent most of his time trying to puzzle out the situation, rather than using his fists to solve a problem. It’s unclear if Scarecrow knew why people were scared of him, but to have that power so easily removed from him was a nice moment. And there’s a nice coda between Alfred and Bruce concerning nightmares. I would have enjoyed seeing this one animated. I should mention Bruce’s nightmare is unnervingly similar to scenes from the Arkham Asylum video game almost 20 years later. Weird. Do you even have to ask? It’s Parobeck! No. In fact, this story references a previous comic story, building the book’s own sub-continuity.